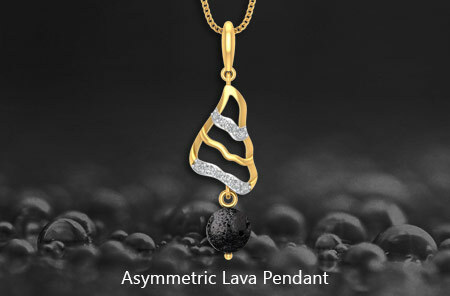 The designs of the Lava Collection by PN Gadgil Jewellers takes its inspiration from the unique pattern formation of the flowing lava during volcanic eruption. The Lava jewellery collection of select earrings, pendants, rings and bracelet has been launched for the first time comprising an unmatched fusion of 18K Gold with 100% natural Hawaiian volcanic lava beads. Each and every design in the collection is distinct and way more personal to give a touch of uniqueness for women who prefer fashionable diamond jewellery. Every piece of this mesmerizing collection evokes that rare feminine natural beauty with a strong fashion statement. The Lava collection definitely elevates the beauty of light weight jewellery, surprisingly at an affordable price. The lava beads are perfectly suited for creating jewellery and can be worn with ultimate comfort and style. Check out some interesting concepts from the collection. 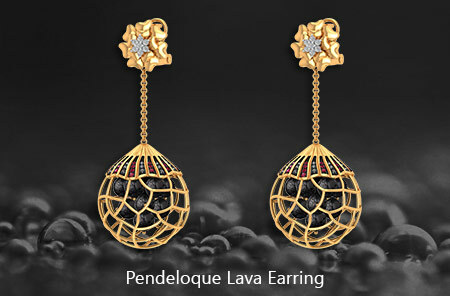 The Pendeloque Lava Earring brings out the fiery, free flow lava all clustered in the form of lava balls. The top of the earring enameled with red and black brings out the fiery red colour of the lava when it erupts and clusters to form the black lava. This suits best with indo western wear. 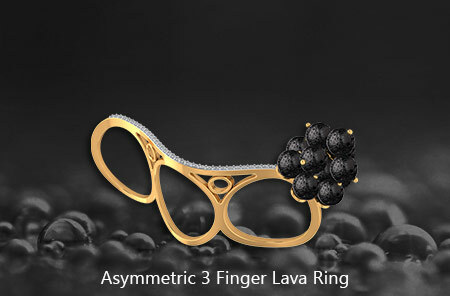 Lava bead three finger ring is a voguish inspiration for one who loves to be recognized for her unique sense of style. The three finger Asymmetric ring is a style statement that defines class for women. Though lava has got its fiery side, it has got its elegance too. 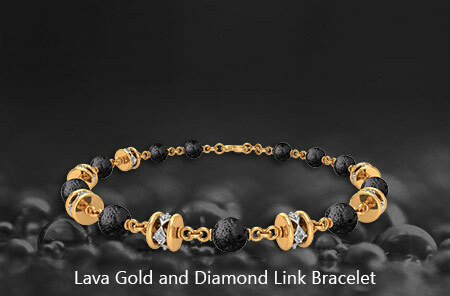 Lava beads when used with diamonds make a beautiful sleek bracelet. The Lava gold and diamond bracelet with white and black sequence of colour that it shines through makes the bracelet a desirable one. The asymmetric lava pendant design adds to your feminine appeal with wavy design and diamonds embedded on the asymmetric lava pendant. 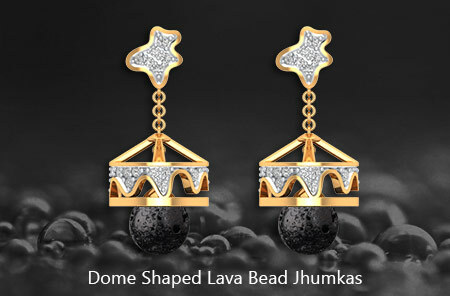 It captures the essence of free flowing lava and accentuates your look. For a fascinating and traditional touch to your look, the lava bead jhumkas bring out the true essence of a woman. The gold jhumka earring with diamonds and lava bead on it reflects the calmness that occurs after years of a volcanic eruption. This collection has been created with love and care for both men and women who love the touch of nature and what better than adorning their jewellery as well! For more such stylish designs of natural lava bead jewellery, Browse through the unique, trendy lava bead jewellery from the exclusive Lava Collection. Shop Now.